Specifically, the account that you use to sign in to TSM must be a member of the Administrators group on the Windows computer where Tableau Server is installed. 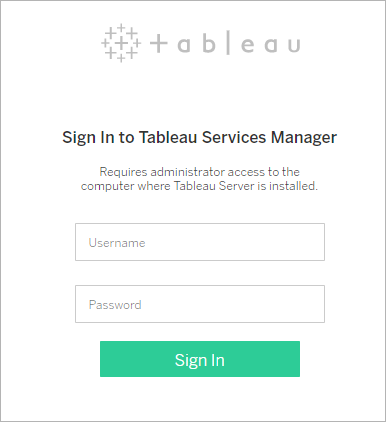 Note: Tableau Server creates and configures a self-signed certificate during the installation process. This certificate is used to encrypt traffic to the TSM Web UI. Because it's a self-signed certificate, your browser will not trust it by default. If you are logging into TSM Web UI from a remote computer (i.e., not in the Tableau Server cluster), then your browser will display a warning about the trustworthiness of the certificate before allowing you to connect.